Zakynthos is one of the Greek Ionian Islands located off the west coast of the Peloponnese. The island is one of the greenest and most beautiful in the archipelago and boasts some superb sandy beaches. It's the beaches of Zakynthos that make the island a magnet for the package holiday hordes that migrate here between Easter and October. The busiest seaside resorts rival those of Corfu in terms of their frantic nightlife and all-action beach scene. But if you venture further afield than the main resort areas you'll find some lovely secluded coves, dramatic mountain scenery and unspoilt inland villages. 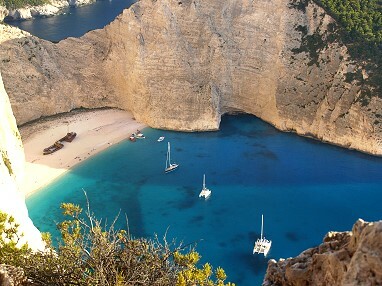 Tour groups fly directly to the island's international airport, six kilometres south west of the capital Zakynthos Town. There's at least one daily flight to and from Athens and regular bus services connect the island capital with the mainland port of Patras (3.5 hours) continuing on to Athens (another seven hours). If you're an independent traveller planning to visit in high season be warned that most of the hotels, especially those in the south coast resort areas, are block booked well in advance by the tour operators. The island's mega resort is Laganas on the south coast where 14 kilometres of golden sand gently shelves into shallow water. The main beachfront is chock-a-block with bars, restaurants, hotels and apartment blocks and you'll find all manner of watersports and leisure facilities including ballooning and glass-bottomed boat rides. If you're after 24-hour partying, Brit bars, curries and quiz nights then this is the place for you. You may even find yourself swimming alongside the beautiful loggerhead sea turtles which use the soft sand of the south coast beaches as their nesting grounds. Sadly the turtles, which have been migrating to these shores from Africa for thousands of years, are now one of Europe 's most endangered species primarily because of the ravages of mass tourism. Environmentalists are increasingly finding themselves at loggerheads with the tourist industry which has fiercely resisted various controls designed to protect the turtles. The tourists themselves will ultimately have to take responsibility for the demise or survival of these delightful creatures. Rules such as the ban on visiting designated areas from dusk till dawn during the breeding season should be strictly observed. A favourite island excursion is a boat ride to the Blue Caves in the north where the sea is so clear and such an exquisite colour that your skin appears blue when you swim in it. The famous Shipwreck Beach, at the north western tip of the island, is also on most excursion boat schedules. It's a superb beach, named after the skeleton of the cargo ship which ran aground here in the 1960s, and despite the hordes of day trippers who arrive here daily in the summer months it's mercifully free of tourist trappings. If you hire a car or sturdy motorbike you'll be able to explore the island's pretty inland villages and impressive western coastline with its dramatic cliffs and breathtaking sunsets.